Patients should be informed about the benefits and risks of endoscopic retrograde cholangiopancreatography (ERCP). Only specially trained and competent personnel should carry out endoscope reprocessing. Manufacturers of duodenoscopes should provide detailed instructions on how to use and reprocess their equipment. In the case of modifications to their equipment, manufacturers should provide updated instructions for use. Detailed reprocessing protocols based on the manufacturer's instructions for use should clearly lay out the different reprocessing steps necessary for each endoscope model. Appropriate cleaning equipment should be used for duodenoscopes in compliance with the manufacturer's instructions for use. Only purpose-designed, endoscope type-specific, single-use cleaning brushes should be used, to ensure optimal deaning. • Prevent any formation of biofilms. In addition to the leak test, visual inspection of the distal end as well as regular maintenance of duodenoscopes should be performed according to the manufacturer's instructions for use, in order to detect any damage at an early stage. The entire reprocessing procedure in endoscope washer·disinfectors (EWDs) should be validated according to the European and International Standard, EN ISO 15883. Routine technical tests of EWDs should be performed according to the validation reports. 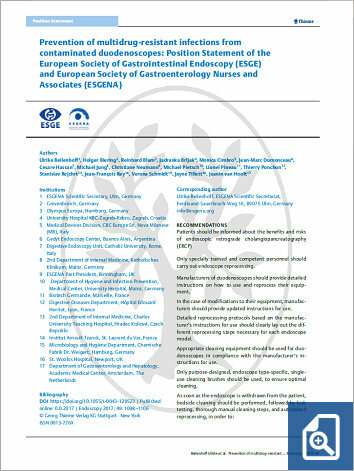 Microbiological surveillance of a proportion of the department's endoscopes should be performed every 3 months, with the requirement that all endoscopes used in the unit are tested at least once a year. In the case of suspected endoscopy-related infection, the relevant device (e.g., endoscope, EWD) should be taken out of service until adequate corrective actions have been taken. Outbreaks should be managed by a multidisciplinary team, including endoscopy, hygiene, and microbiology experts, manufacturers, and regulatory bodies, according to national standards and/or laws. In the case of suspected multidrug-resistant organism (MORO) outbreaks, close cooperation between the endoscopy unit and the clinical health provider is essential (including infection control departments and hospital hygienists).